To tie this unit to climate change, the students were tasked with participating in a fishbowl discussion during which they were given the guiding question “What should our energy policy be?” Science teacher Kelly Steiner shares that she hoped this would provoke a thoughtful conversation amongst the students about how we as global citizens should be generating our electricity. 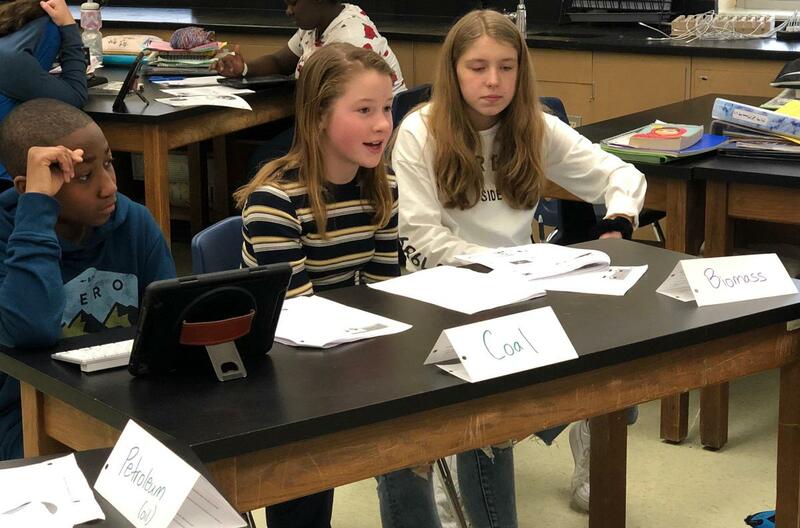 “In class, students learned that power generation is a primary component of carbon dioxide emissions, leading to the largest impact on the climate,” says Steiner. Students each chose one of the nine fuels from which electricity can be generated—wind, solar, hydroelectric, nuclear, biomass, coal, petroleum, natural gas, geothermal—and had to defend their fuel choice while attempting to convince peers that their source was the best choice. During the fishbowl activity, students shared opening statements, had a long, open discussion about the fuel sources, and provided closing arguments compelling other students to agree upon their fuel source.